Note: Staff Sergeant Amanda McCarty is TDY with U.S. Africa Command colleagues Jack Holly, Freeman Nlandu, Nicole Dalrymple and Stars and Stripes reporter John Vandiver, to the Democratic Republic of Congo (DRC) in support of the U.S. government’s humanitarian demining training being conducted in Kisangani. Boating down the massive Congo River in a carved out wooden canoe, a light rain quickly turned into a downpour with lightning and hail, then the engine went out. Nicole, John and I, along with John Travis Jr and Didier Lifenya with the Borlaug Institute, were soaking wet as we excitedly continued toward our destination – a restaurant named Bamboo Palace. Of course, we quickly became the only ones on the river and locals looked out at us oddly from under dry cover ashore. The boat was slowly filling up with water and the boat’s driver decided to pull ashore after restarting the engine. We quickly found cover in a nearby outside bar. We sat down and waited, hoping the storm would pass. Still quite wet and a bit chilly, we all agreed to press on again to the restaurant after the storm lessened to a sprinkle. With a rapidly darkening sky, we headed downstream. Other boats joined us on the waters, providing some comfort that we weren’t alone in presuming the storm had passed. Nightfall left us boating in the dark down the Congo for the remainder of our journey and only flashes of pink lightening provided us enough light to see our surroundings better. The boat’s engine continually died and Nicole, John and I were all thinking we might have to swim to shore. And, after hearing about the infamous Goliath tigerfish that have shark-like teeth and can grow as large as humans, I was hoping there were paddles hidden somewhere. Although we couldn’t see much except the dark blue sky, a black outline of the trees on the shores and a few house lights in the distance, it was serene and beautiful. We floated toward the coast in search of the one spot along the river’s edge where a set of very vertical steps allow boaters to disembark and access the restaurant above. After we found the exact location in the darkness and ascended up the ladder-like stairs, we all settled into our chairs and awaited our long-sough-after meal of fish, beef and plantains, discussing our adventure that left us all with an interesting story to tell about our trip to the DRC. It was Veterans Day, cold (4 degrees C, 39 F), wet and windy at 4 a.m. when my mother and I boarded a bus to begin our USO tour to the Meuse-Argonne American Cemetery in France. Five hours later the country and terrain had changed but the weather was still the same, not pleasant. This trip was special for me; it was the first time in 20 years I would have a day with just me and my mom. She and my father are visiting for 7 weeks from El Paso, Texas. Unfortunately, Dad was ill and unable to make the tour. Regardless, we were on our way knowing that Mrs. Elizabeth Plotner, the USO Stuttgart Tours Manager, had a great day laid out that would surely “build memories for a lifetime,” to use my mom’s words. I don’t know much about WW1; trench warfare, mustard gas and the beginnings of aerial combat about summed it up for me, so I did a bit of reading up before the tour so I was ready. As we left the autobahn just south of Clermont-en-Argonne and began the winding trek north through small villages and farmland I tried to imagine what it must have been like to be here, fighting, in this area nearly 100 years ago. It wasn’t really that difficult of a task because so many of the buildings haven’t changed much. This region has little industry, and according to Mrs. Plotner, most folks here are retired. Quiet villages, each with their own war memorial, are stretched out across the hills and valleys which once were aflame with battle. We passed by the hilltop where once stood the village of Vouquios before the German Army mined beneath it and obliterated it from below with explosives that literally removed the hilltop. We also paused shortly at the Pennsylvania Memorial in Varennes. The monument was erected by the State of Pennsylvania “In honor of her troops who served in the Great War” in 1927. Varennes is the village where Louis the 16th and Marie-Antoinette were captured 21 June 1791 while fleeing Paris. Soon after we had arrived at the American cemetery. The Meuse-Argonne Cemetery is the largest American cemetery in Europe; the 130 ½ acres of manicured lawns and gardens is the final resting place for 14,249 fallen Warriors of World War 1 and also commemorates another 954 whose remains were never found. Nine Medal of Honor recipients are buried here including Corporal Freddie Stowers, who died valiantly in the battle for Hill 188 in the Champagne Marne Sector of France. He was the first African American to ever receive a Medal of Honor. The ceremony, conducted outside the chapel which overlooks the gradually slopping hillside with thousands of white crosses and stars of David, was simple and yet profound. The highest ranking military members of the area were present as were the local Mayor and other civic leaders. French military reenactors, decked in WW1 wool uniforms, stood proudly in formation across from elderly French veterans each holding national and military flags. The American National Anthem was followed by the French National Anthem, each a recording of a bell choir. The American and French national flags on the poles above our head blew out in the wind as a message from President Barack Obama was read by Mrs. Plotner and then a lone trumpeter sounded Taps; not a sound was heard from the assembled audience. Following Taps there was another short trumpet call was played; we were told it was the sound of Cease Fire, the same call that was sounded not far from the Cemetery at 11 a.m. on November 11, 1918…. The Great War was over. Wreaths were laid and old memories resurfaced in the minds of the elderly while new memories were formed in the minds of the children. Shortly after this ceremony we were treated to another special ceremony just down the road in the town of Romange where a different monument stands, this one dedicated to the French Resistance fighters who fought so valiantly to support France against the Germans. This ceremony was similar to the one we had just attended. To my great pleasure I observed French grade school children standing rigidly at attention as the American National Anthem was played. I thought to myself how sad that we in America are so quick to forget how to give respect to our Flag and Anthem when here, in a little French village French school children know better how to show respect than grownups in my own country. The end of the ceremony was truly special. A young man stepped before the monument and stood at attention facing the crowd while an older man, carrying a worn French flag on a simple wooden staff stepped forward to face him. A few words said in French and the flag was passed from the old man to the young. The leadership of the French Resistance had just been passed from a father who was too old for battle to his son who now would take up the cause in protecting their lands. The reception following this ceremony was all French Champagne and fresh breads, language barriers collapsed and there were smiles from all who attended. At one point one of the older French military reenactors approached me and took my hand to shake it but he didn’t let go. He told me he was honored to participate in these ceremonies because he was the son of a French fighter pilot that fought alongside our “boys” during WW2. He teared up with pride in sharing that his son was now with our “boys” in Afghanistan serving in the French Army. The brotherhood of arms, pride in our profession and the sacrifice of our families is the bond that links us all over time. Lunch was simple sandwiches at the Romagne ’14-’18 Museum whose curator and owner, Jean-Paul de-Vries, proudly displays artifacts from the time. He has around 60,000 artifacts in his collection of which 98% he personally found over the last 35 years. His searches, which he limits to a 5 km radius of the museum, have unearthed war craft of all sorts from all the various units that fought in the area. This Dutchman with French citizenship used to search the densely foliaged woods of the area until at age 19 he came across a forgotten trench which still held the bodies of two fallen soldiers. This event changed his focus from the woods to the 100 plus hectares of farmlands in the area. Each year after the fields are plowed Jean-Paul walks the rows and literally finds a gold mine in war relics strewn across the uprooted earth. Where we would only see dirt of one or two shades of brown he sees multiple shades and the most minute of variances assisting him in his collection efforts. He can only display 1/3 of his collection at a time and he rotates it yearly. When asked what his most prized possession was, he highlighted some children’s leather shoes. These shoes, crafted from old German boot leather, were made by a German soldier for French children. According to Jean-Paul, that means this soldier was likely a father or uncle back before the war. Focusing on children, Jean-Paul uses his relics to teach about peace. “You take off the helmet and what do you have underneath?” he asks, “a man, doing his job.” He prides himself in his ability to change visitor’s perspective on the battles and make the war real to them. Later in the day we visited a German cemetery. This was truly a sad event. There was such hatred toward the Germans by the French that dishonoring the dead appeared to be a focus at the end of the war. The cemetery’s official record says that just over 1,400 fallen warriors were laid to rest here but Jean-Paul, among other experts, suspect that it is more like 10,000. This belief was validated 10 months ago when a large storm toppled several of the pine trees among the graves. Interwoven in the root systems was evidence of three layers of remains. At the end of the war there were many small cemeteries across the region that held the bodies of fallen German soldiers. Traditionally when a solider dies in battle, they are buried in a cemetery on that battlefield or, under the best of circumstances, they are returned to their homeland. Instead of following this tradition ,the French moved these bodies to one centralized cemetery; or at least most of the bodies. Many of the smaller cemeteries were desecrated, the original square head stones were collected and when possible the bodies were moved but often they were just left behind. The region now could then boast a 6km road built with headstones; words facing down. “You don’t want to shame yourself in what you are doing,” says Jean-Paul. The French employed four tactics to dishonor the Germans. Their graves lay under black crosses instead of traditional white. They buried them under tall pine trees in order to prevent the sun from ever shining on their graves. They moved them from their rightful burial sites but didn’t send them home and they planted ivy on the graves, a plant associated with death. Jean-Paul is one of a few volunteers to come out once a year to light candles, one for each of the Soldiers in the official records of the cemetery. No other ceremonies occur here despite the fact that the German government actually owns the land. By this time in the afternoon the light drizzle that had begun hours before was turning to freezing rain. The dark headstones of the cemetery, the images we had in our minds of the fallen and their subsequent disgrace took on a powerfully sad persona. I couldn’t imagine how difficult this time was for the French and Germans alike. Thin undershirts, wool outer garments and maybe a wool blanket to curl up on under as steel rained down day after day while they were so very far from home. The cold, the wet, the horror. Hatred is a vile thing, in times of war and in the times of peace that follow. The top of the Pennsylvania War Memorial has an inscription around the brass basin which reads, “The Right is More Precious than Peace.” War, it is about people and not the tools that we use to fight it. The Right must prevail even at the temporary expense of peace. I am honored to be a veteran, the son of a veteran and a government service employee. I am proud to be affiliated with all those who came before me and those who serve today or in the future to include a few of my children who have already determined service is important to them. God Bless our Veterans, the Veterans of our foreign Allies and God Bless America. A recent TDY took me to Addis Ababa, Ethiopia, to support a command post exercise conducted by the Africa Standby Force (ASF). I had waited a year hoping to travel to the country. Although I always enjoy traveling to new countries and experiencing different cultures, I had a very personal interest in Ethiopia – one of my sisters was born there. Woinshet was adopted from Le Toukoul orphanage in Addis as a young girl. I very much wanted to see her culture and learn more about the country. Ethiopia is slightly less than twice the size of Texas and has a population of more than 88 million. It is known for its coffee, which is critical to their economy. Cotton, sugarcane, potatoes, cattle, sheep, goat and fish are also farmed in Ethiopia – a few of which I tasted at a local restaurant. Together with Arthur Kelly and Gunnery Sergeant James Moore, both from AFRICOM’s C4 Systems, I went to try the Ethiopian fare at Yod Abyssina. The food: lamb, goat and beef with injera and spices. They were all quite good, even though I was nervous about eating goat for the first time. The entertainment was even better. A band, accompanied by three male and three female dancers performed dance after dance, changing wardrobes each time. Dances that relied heavily on neck and shoulder movements were the most intriguing to me. I also really enjoyed seeing what attire the dancers would wear next (one included the men wearing baboon hair). It was an excellent dinner and great way to experience more of the Ethiopian culture. I also toured the city, met many of its people, shopped…and hoped for the chance to meet Woinshet’s older brother during my stay. The shopping was easy. I went around the city selecting some Amharic music, traditional Ethiopian dresses, jewelry, books and coffee to send home. Finding a brother was not as easy. But, after days of tracking down the right person at the adoption center, Internet searches and a little translation help from an African Union friend, I had finally found him and arranged a meeting. I finally accomplished what I had sought out to do for the past 12 months – meet my “brother” Mesafint. Both visibly excited, we hugged and greeted each other. I explained who I was and that I was in town helping to support the African Union for work. We learned about each other, exchanged family photos and updated each other on our families’ wellbeing – largely through the assistance of a translator. Since Woinshet and her brother haven’t seen each other in years, we attempted to make a video call via Skype, but technical difficulties prevented it from happening. Instead I took some photos of Mesafint to send back home. Then we hugged and it was time for him to go. I had accomplished what I had set out to do personally, but now I wanted to do more. I headed out on a mission to find the orphanage where Woinshet had once lived. After much toil, I got to the orphanage’s office. I introduced myself and explained my quirky story. Then, I told them what I wanted to do – bring orange sodas to all the children. The explanation? My sister immediately had an obsession with orange Fanta when she first came to my family, desiring to drink multiple cans at a time. She later explained the children got orange Fanta and bubble gum just once a year at Christmas. My heart melted. So, I got the idea to bring sodas to the kids at the orphanage. Although I could have used the money it cost to buy 240 Fantas (the number of children there) for a different purpose, I wanted to do something for each child, not just a few. I remembered how special the treat was to Woinshet, so I set out to find a store that would sell that much soda. After running around town to find a working ATM machine (which was quite a task), I located a market and got all the soda. The orphanage staff seemed grateful and I felt so excited for the children to be able to enjoy it. The orphanage visit, meeting Mesafint, the whole visit to Addis really reminded me of how lucky I was. I take so much for granted and don’t often stop to realize how truly blessed I am in my own life and to have a truly unique opportunity working for U.S. Africa Command and being able to travel throughout the African continent to play a small part in helping bring peace and security to Africa and each time being humbled. Jambo! That means hello in Swahili. I’m here in Mombasa, Kenya attending the Kenya Government’s Pandemic Disaster Response Tabletop exercise. It’s a really exciting time to be in Kenya the week when their new constitution will officially become law. As the deputy chief of mission for the U.S. Embassy in Kenya said at the opening ceremony for the exercise, the August 4 referendum, backed by the majority of the population (67 percent), begins a new chapter in the nation’s history. Friday, August 27, is a national holiday for Kenya, as the nation celebrates the promulgation of the new constitution by President Kibaki. Although we will be working that day, I am looking forward to sharing this occasion with our Kenyan partners here for the exercise. The exercise itself is going very well, and I’m always impressed by the dedication and enthusiasm shown by the participants. There are nearly 50 civilian and military representatives here from Kenya, along with representatives from international agencies. Throughout the week, they have been working together to practice coordinating among the various agencies to respond to different disaster scenarios. In observing the briefings and focus groups, I have been learning a lot about how important interagency coordination is and how a pandemic can impact the government on so many levels–it extends beyond a health concern, also impacting security of a region. For instance, a pandemic could shut down ports making it difficult to bring in necessary vaccines, medicines, food, and other aid. It would also damage the country’s economy. We visited the Port of Mombasa on Monday to talk with Kenya Ports Authority managers about their contingency plans for disasters such as pandemics, tsunamis, oil spills, and acts of terrorism. The KPA staff talked to us about their disaster response plans and answered questions. Known as the Gateway to East and Central Africa, the Port of Mombasa is Kenya’s only deepwater port and links Kenya to Uganda, Rwanda, Southern Sudan, among other land-locked countries. Its main imports include crude oil, fertilizers, salt, sugar, and wheat and its main exports include coffee, tea, canned fruit, and cement. Being prepared for any kind of disaster (oil spills, pandemics, tsunamis) is so important, especially for a regional gateway port such as this one. What they told us is that they have disaster response plans which are integrated into the national plans. They practice oil spill drills annually, and are also compliant with International Health Regulations (IHR). A recently built control tower standing at 89 meters enhances navigational safety and security in the port. Their most recent disaster was in May 2005 when a tanker punctured a cargo ship with 300 metric tons of oil. They were able to combat the oil spill in 24 hours and cleaning the beach took two weeks. After the meeting, we got the chance to tour the port area, which was a really unique experience. It opened my eyes to the huge scope of the port activities, and made me more aware of the very serious impact a disaster would have on the nation if the ports were to be shut down. Whenever I travel to events like these, I try to see as much of the area as I can during our off-hours. Kenya is a popular destination for its amazing safaris, and so I made sure to fit that in over the weekend. On Saturday morning we set off bright and early (5:30 AM) for Tsavo National Park which is about two hours from Mombasa. We saw mostly elephants and zebras and a few giraffes, but towards the end of our safari we stumbled upon some female lions resting under a tree (and a lone elephant moving dangerously close to them). One of my favorite parts of the safari was when all the animals (zebras, elephants, and warthogs) were running from different directions to the same watering hole. I have never seen elephants move so fast before! I got some great photos. of them all together sharing the water hole. We also saw a few black-legged zebras (or zebras who played in the mud too long leaving their bottom half black). I really wish I had a few more days here in Kenya to make the trip over to the Maasai Mara and see the famous wildebeest migration. Every year between July and October, more than a million wildebeest migrate between the Serengeti in Tanzania and the Maasai Mara in Kenya in search of grass and water. It’s supposed to be an amazing experience to see the masses of wildebeest crossing the rivers. The Maasai Mara was too far from Mombasa for me to visit in one day, but I hope to come back another time to see that. On Tuesday I had the opportunity to accompany Brigadier General Stayce Harris, U.S. AFRICOM’s mobilization reserve assistant to the commander, to tour the Old Town of Mombasa. It’s a very small section of town with a lot of history. Our tour guide showed us the old port which is now used only to ship things between Kenya and Somalia. He also showed us the first post office (now an antique shop), and the first mosque in Mombasa. Mombasa is the second largest city in Kenya with a lot of Portuguese influence. In Swahili it means “Island of war” because of all the fighting over it during the time of colonization. The main attraction in town is the Portuguese fort built in 1593 called Fort Jesus to protect the old port. The fort is built in the shape of a man with a head, arms, and legs. It was given the name “Jesus” because of its shape and also the Christian influence by the Portuguese. Also on display at the fort is the first train between Mombasa and Nairobi. It was literally a chair on a platform with wheels on a track. It had to be pushed, and our guide told us it took six months to get to Nairobi. It makes you appreciate today’s speed trains! Fort Jesus was captured by the Oman Arabs in 1698 and became a government prison in 1895. It is now a UNESCO World Heritage Africa site–a must-see if you are in Mombasa! In spite of our busy work schedule, I’ve managed to see a lot of the city and the coastal area. The people here are all so friendly. Everyone I meet asks me if I know their “cousin” Barack Obama, and I’ve gotten some “good deals” on purchases because of it. The exercise ends tomorrow (Friday) and we fly back on Saturday. I hope I can return to Kenya someday to see more of this beautiful country. I thought I knew what to expect from the continent of Africa. Granted, my feet have only touched soil in seven countries here, but somehow I felt that I had it all figured out. However, Mozambique is full of surprises and newness. The first surprise was the weather. I disembarked from the small aircraft yesterday morning into what can best be described as a tropic chill. Winter along the coast of southern Africa consists of temperatures typically ranging from 50-85 degrees Fahrenheit, and yesterday’s cool morning air begged for a jacket. No hot weather here. The second surprise was the easy fusion of Portuguese and African styles in food, language and architecture. Although Mozambique gained its independence from Portugal more than thirty years ago, this place has certainly retained elements of that influence. Portuguese is still spoken here, the food has a distinctly Mediterranean flair (lots of grilled fish, simply prepared vegetables, and fresh fruit), and many of the homes and buildings here are constructed with red tile roofs and beautifully worked wrought iron. Today’s events included a military brief to members of the local press about an upcoming combined exercise, SHARED ACCORD. One of the things I love about being a journalist is the sense of community that exists within our world. As U.S. and Mozambique military leaders spoke, the photographers, writers and videographers moved effortlessly around each other. With facial expressions and improvised sign language, we easily communicate our need for certain shots or angles. It didn’t matter that I don’t understand Portuguese, or that they might not speak English. We all had the same mission and a similar understanding of the courtesy and effort required to make that mission successful. That type of understanding is what I believe SHARED ACCORD will provide for Mozambique and the U.S. during the coming weeks. I will be working in Mozambique’s capital city, Maputo, as the press chief for SHARED ACCORD until its conclusion August 13. The exercise, which is an annual, scheduled event, allows U.S. and Mozambique troops to become familiar with each other’s operating styles, and to build the capacity of Mozambique forces for future peacekeeping operations. I am excited to be here, and looking forward to the chance to exchange information, ideas and experiences with people from this already fascinating place. Can’t wait to share the adventure with you. While in Zambia writing about the selfless act of a fellow Airman and visiting local HIV/AIDS clinics, I was inspired to find something I could do to make a difference. The people are so friendly and their country is peaceful and beautiful. I wanted to honor them and give some small token of my gratitude. After seeing a blood donation photo of the Charge d’Affaires of the U.S. Embassy in Lusaka, Michael Koplovsky, I knew that was exactly what I could do. I immediately asked about the possibility of donating at the Zambia National Blood Transfusion Service (ZNBTS) at University Teaching Hospital in Lusaka. I went through an initial screening to ensure my blood would be safe to use and I was in good health to donate. After a short moment of worry that my malaria medication might throw things off, I was relieved to hear it wouldn’t be a problem. The nurse phlebotomist who’d screened me went on to explain the simple process of how blood is collected. David Chama, the manager, further explained that Zambia has a main ZNBTS office, nine regional centers and 132 blood banks. ZNBTS receives funding from Americans through the U.S. President’s Emergency Plan for AIDS Relief (PEPFAR). 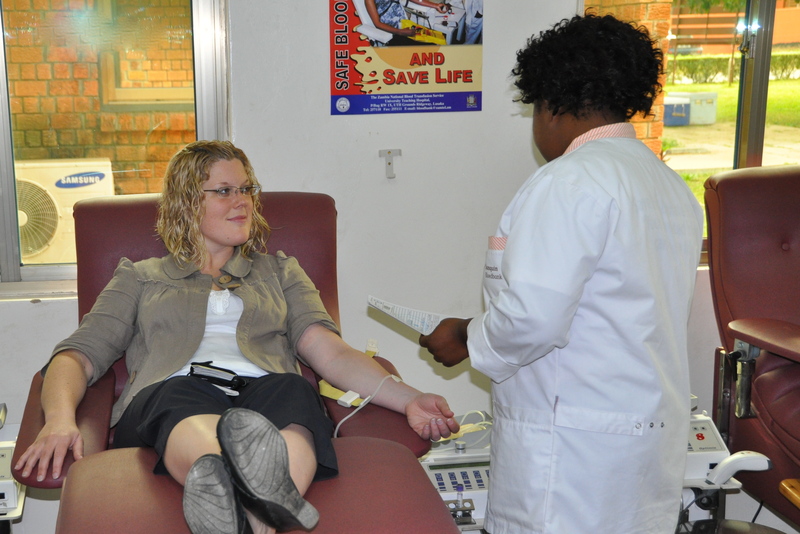 The program partnered U.S. and Zambian governments to train staff and improve transportation of blood as well as to ensure access to safe, affordable and effective blood transfusion services for Zambians. Most patients in Zambia who need blood transfusions are children under 5 and women suffering from pregnancy complications. Blood is also used for patients who’ve lost a lot of blood due to accidents or surgical operations. Nine minutes and 48 seconds after the needle entered my arm I was done. In less than 30 minutes total, I had given just under a pint of blood that could potentially help save a life, just as the rest of Americans do through the PEPFAR program. And although my act didn’t require much bravery, I felt proud that my small deed could help at least one Zambian in need and that I had given back to the community that was so welcoming to me during my stay.